With that famous line in Billy Wilder’s classic hymn to old Hollywood, Norma Desmond told us two things about the great silent movie actors: that they were justifiably proud of their talent for conveying character without words, and that they were afraid of the change that sound would inevitably bring. Some actors, either blessed by nature with a pleasant voice or by training for the theatre, would make the transition to ‘talkies’ smoothly. Others would not. Nevertheless, the silent era provided some of the most powerful moments in movie history. This period gave us everything from the vast scale of D.W. Griffith’s sets for INTOLERANCE in 1916 (never matched since) through to the most intimate of human moments from those cherished faces - and in an unspoken language the world could understand. Silent film presented every genre that could work visually - from historical epics through fantasy and drama to action and physical comedy. The horror film was well suited to the silent era. On screen you could show the terror in a victim’s eyes or inspire it in the audience with the grisliest of monsters; stage the crudest of jump-shocks or the subtle, eerie atmosphere of a haunted house, accompanied by the lush score and precisely-timed cues of a large orchestra or just a single pianist. Even the power of silence itself could be used for a pause of heart-stopping suspense. The history of horror cinema almost spans the history of the medium itself, predating the twentieth century. Whilst the first ‘consecutive motion’ film ever made is Louis Le Prince’s two-second ROUNDHAY GARDEN SCENE (1888), the earliest horror film released was LE MANOIR DU DIABLE (THE DEVIL’S CASTLE) made by George Méliès in 1896. With immigrants pouring into America at a rate of a million a year by the early 1900s, it had a swelling audience for silent movies where language was no barrier to universal entertainment .Two million tickets a year were sold. This consumed a vast amount of product, but back then the town of Hollywood in California didn’t yet exist as an industry, so films had to be imported from foreign countries like England, Italy and France. This gave European film-makers such as Frenchman Georges Méliès a huge international market for his vast output of ground-breaking fantasy and horror shorts. American studios churned out cheaper, crudely-shot motion pictures featuring stage actors who were embarrassed to be involved in these ‘flickers’ as they labelled them. European directors like Méliès embraced the new medium, experimenting with pioneering effects, sets and lighting of greater sophistication. He began professional life as the son of a footwear manufacturer in Paris, and used his position to enable the purchase of the prestigious Theatre Robert Houdin in 1888 where he could indulge a passion for the stage magic and illusions he’d studied in London. After attending a demonstration by the Lumière brothers of their new Cinématographe technology in 1895, Méliès was so taken with its possibilities that he transferred his enthusiasm to working in film. The brothers refused to sell Méliès one of their machines; undaunted he threw himself into designing one of his own and one year later was giving shows to the public, initially of other companies’ one-reel shorts. As his confidence with the new medium grew Méliès began to produce his own films, coupling his magician stagecraft with the first use of in-camera special effects, creating much of our film grammar as he went along. Legend has it that he discovered the technique of ‘jump-cutting’ by accident when filming in Paris one day. His camera jammed just as a bus entered the shot. Upon re-starting the scene, a funeral hearse had replaced it - but when he later watched the ‘rushes’ (the day’s rough filmed footage), the bus appeared to change into the hearse as if by magic – a jump-cut substituting one vehicle for the other. In that moment Méliès saw the potential of this new entertainment to wondrously deceive audiences, and over the next twenty years he crafted almost five hundred horror and fantasy movies, inventing new cinematic language as he went along…. 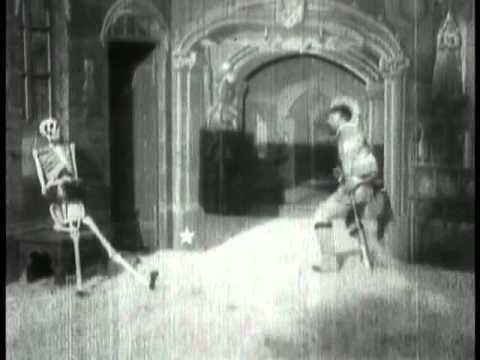 LE MANOIR DU DIABLE (1895) is a tantalising glimpse into Méliès’ joyful experimentation and his penchant for magical illusions in this new box-of-tricks art form. His feverish work-rate meant that this was his seventieth film of the year. At just over three minutes in length, LE MANOIR is essentially a fast-paced series of vanishing and substituting characters and creatures, repeatedly using the aforementioned stop-motion photography gimmick. The static camera simply records a performance stage face-on as if we were witnessing one of Méliès’ theatre magic acts from a stalls seat. The acting style is broad and played out-front very much like a traditional theatre pantomime, albeit with elements that mark this out as the very first horror movie. Against a painted scenery arch-way, a flying bat turns into the Devil (Méliès) in the blink of an eye, who prowls the stage in his doublet and hose and with a shazam-like flourish conjurs up a dwarf and a giant cooking pot out of which pops a lady, resembling a magician’s assistant (Jehanne d’Alcy, the director’s future second wife). After they evaporate, a pair of flamboyant cavaliers enter, who are outwitted by the playful dwarf. When his master appears, since he turns into both a skeleton and then a bat this is arguably also the first vampire film on record. For good measure, the Devil invokes four white-sheeted ghosts who torment the first cavalier into hand-to-brow hammy theatrics. Satan leads in the woman, who becomes one and then all four of the spectres, the mounting confusion being such that the returning second cavalier ‘spiritedly’ throws himself upstage off the balcony. It only remains for the lone soldier to see off the cowering Devil with a handily wall-mounted crucifix. The End. 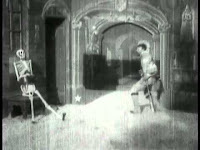 The fast-paced bravura thrills of LE MANOIR DU DIABLE was typical of Georges Méliès, as was his reusing of staple themes and techniques as he churned out films to satisfy a newly-eager public. The canny showman realised if an effect is good box-office once, why not recycle it? Disembodied and decapitated heads can be seen in many of his films in a country where the guillotine was still used for executions. The Devil reared his sulphurous head again in such follow-ons as THE HAUNTED CASTLE and THE LABORATORY OF MEPHISTOPHELES in 1897. The film-maker had by now built his own Star Film Studio combining photography and theatre, allowing him complete control of every aspect as director, producer, ideas-man, set painter of stunning scenery and star actor. The theatrical flavour of his work was further enhanced by his close company of actors recruited from the Folies Bergere and other variety venues. He was truly an auteur and amongst other on-screen trickery his technical experimentation gave us under-cranking, superimposition, animation effects, model shots, all manner of optical illusions and double exposure. Méliès’ work did not exist in isolation though. The latter technique was being touted as a legally-protected effect elsewhere in Europe around the same time. English film-maker and former psychic researcher George Albert Smith promoted a series of ‘spirit photography’ FX films using double-exposure, which he’d managed to secure a British Patent for. Although it granted him ‘Protection in Great Britain and abroad’ he never contested the Frenchman’s display of the same effect. The two men had much in common, sharing a background in magic that influenced their style and coincidentally the co-opting of ‘Old Nick’ (Smith had also filmed a version of FAUST AND MEPHISTOPHELES). 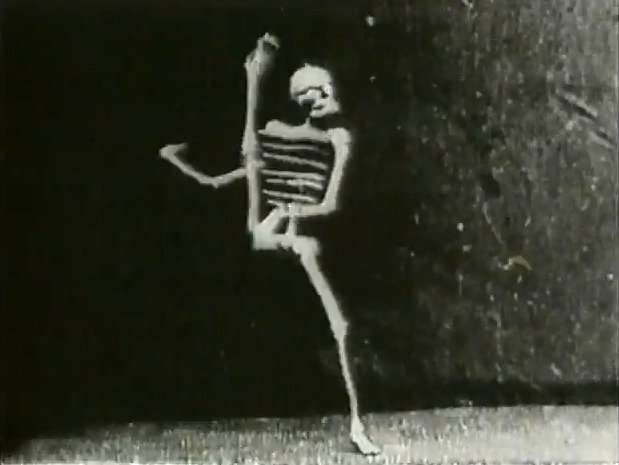 LE SQUELETTE JOYEUX – ‘THE MERRY SKELETON’ (1895). There is also the brief tenuous hint of a horror connection in an early film of the Lumiere brothers, inventors of the Cinématographe camera. 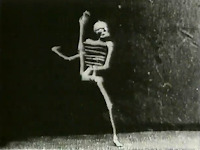 Amongst their gallery of movies was the amusing LE SQUELETTE JOYEUX, forty-one seconds of a puppet skeleton on strings. ‘Dem bones’ jiggle around in front of a dark back-drop, skilfully disconnecting and re-assembling, sometimes dancing independently of the body, and accompanied by a playful xylophone ditty. Gradually, films became more ambitious, lengthening from five-minute wonders into more substantially plotted vehicles as they expanded toward feature length. In 1902 Méliès produced his fantasy masterpiece A TRIP TO THE MOON told over thirty scenes, a relative epic for its time. THE GREAT TRAIN ROBBERY (1903). Across the Atlantic, legendary inventor Thomas Edison was also a pioneer of cinema, though after developing the world’s first robust motion picture film system with his partner W.K.L Laurie between 1888 and 1893, he was less interested in the actual filming. Fortunately one of his employees, former projectionist Edwin S. Porter, was inspired by Méliès in his helming of the company’s production slate. 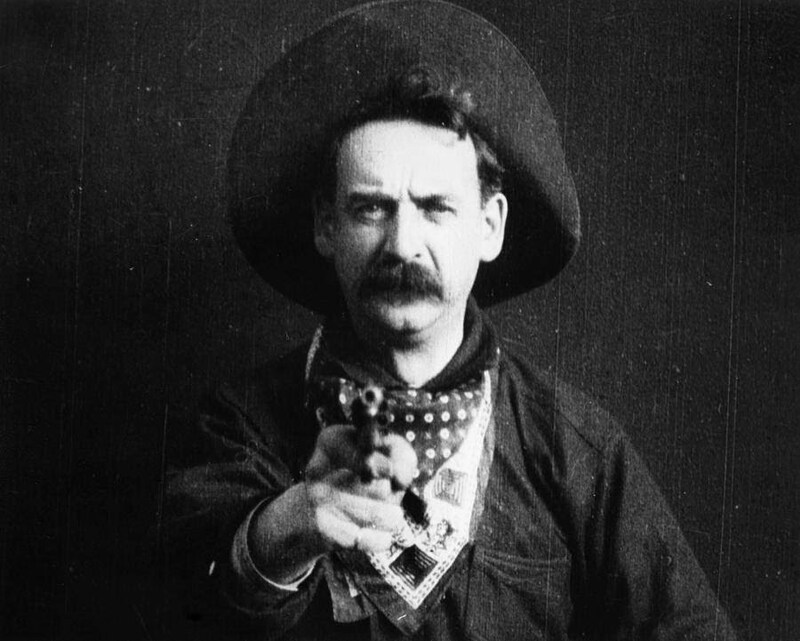 After his derivative FAUST AND MARGUERITE (that ole Devil again), Porter achieved fame in 1903 with THE GREAT TRAIN ROBBERY, the first film to have a clear storyline. Audiences were thrilled with the novelty shock factor of the infamous scene where outlaw boss Barnes points a gun at the camera and suddenly fires straight into our faces. As films grew in sophistication, so too did the environments for viewing them. The nickelodeons housing the cheap quickie shorts became grand, beautiful ‘motion picture palaces’, vast theatres that could accommodate thousands. Not everyone adjusted to the growing of the medium. Georges Méliès, in many ways the father of the modern cinema experience, found that by the end of the nineteen-hundreds he was struggling to keep pace with the commercial side of the movie industry. By now America had ten thousand of these new picture houses and to try to stay afloat Méliès allowed his autonomy to be absorbed into a cartel of producers. They set up a subsidiary, Star Films Ranch in Hollywood, to enable him to fill his quota of product for the U.S. but his position was now fading from being the vanguard to the old guard. Within the next fifteen years, he was forced to dissolve his company and down-scale to selling toys at a kiosk in Montparnasse train station. He died in 1938, his tomb inscribed ‘Georges Méliès – Creator of cinematic spectacle’. FRANKENSTEIN (1910). Edison Manufacturing Company was one of those emerging American studios gaining dominance as the French influence lost ground. In 1910, they became the first to make a movie of Mary Shelley’s novel FRANKENSTEIN, ‘Film No. 664’ in their Kinetogram catalogue, thus presenting the first pure horror genre film ever released. Clocking in at roughly twelve minutes, it’s a brief but effective introduction to the myth. Director and writer J. Searle Dowley chose to sanitise the novel’s horror for the delicate sensibilities of early viewer. The monster is portrayed as a clear manifestation of Frankenstein’s primal inner self, yet the film does not shy away from a vivid creation scene where Victor (Augustus Phillips) ‘reverse-engineers’ the creature from a satanic-looking flaming skeleton rather than a corpse, reviving him not with science but almost the supernatural invocation of a demon. FRANKENSTEIN is also notable for Charles Ogle’s performance as ‘the monster’. He was a veteran stage actor who, as was the custom, designed his own grisly make-up and enthusiastic physical contortions. Despite exaggerated clown shoes and absurdly extended fingers, he committed himself to the role whole-heartedly. There’s a comedic, macabre touch in the way his arm beckons to Victor through the chamber door, as if teasing an audience through a stage front-cloth before entering. Our sympathies in the 1910 film rest firmly with Victor though; little is given to the creature in his lonely and confused plight. Dowley removed any sense of Victor’s responsibility toward his creation or the broken promise made to build him a mate. In fact there’s a moment of farce when the monster attempts to plead with him before quickly hiding behind a curtain when his fiancé Elisabeth (Mary Fuller) enters. Upon seeing his reflection later, the creature throws up his arms histrionically in distress and exits. In lieu of the novel’s shock wedding night revenge of the monster upon his ‘father’ by strangling Elisabeth, we see “Frankenstein’s better nature asserting itself”. The creature frightens the bride and groom but Victor is able to simply banish his tormentor’s image from the mirror and be restored to his beloved’s embrace. All is suddenly right with the world again. Whilst this injects a touch of sanitising romance distorting Mary Shelley’s moral message, the card reads “The creation of an evil mind is overcome by love and disappears”. An ‘evil’ mind rather than a temporarily deranged one? Surely then the fanciful speed of this plot wrap-up can’t disguise further delicious horror possibilities - might Elisabeth be in for the pitter-patter of other satanic feet in the future?